I received this ebook for free in exchange for an honest review. Please note that these comments pertain to the Kindle ebook version only and may differ from print versions. 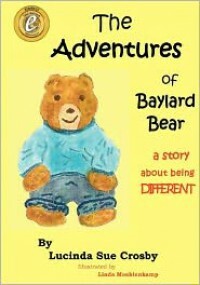 This is a sweet story about adoption as told through the eyes of a bear in the human world. Some aspects of this are uneven, such as an awkward mid-sentence mention of the bear not having shoulders to look over, yet apparently he has hands that can draw pictures. The willing suspension of disbelief in terms of anthropomorphized animals would be stronger if the author didn't selectively highlight differences without bothering to mention why there are similarities. I understand that part of the purpose was to establish the character as different, but it feels clumsy in the handling. - "yady" instead of "lady"
The formatting is also problematic making it difficult for a child to read, particularly the lack of paragraph indentations. My daughter has read through book five of the Harry Potter series so she can handle dense words, but she could not read the wall of text on some pages of this book because there were no tabs to indent. Further, some paragraphs have double spacing and others do not, some are justified, some are full-width, and some are half-width. Headers and captions aren't set in a different style to separate them, making them appear to be part of the body text. The text would also be better if it floated around the graphics. These may seem like nitpicky things, but they seriously impacted my daughter's ability to read the text and made me want to skip sections myself. In her words, "It was kind of hard to read because the paragraphs were all smushed together. If the paragraphs were spacious, then there doesn't need to be as much pictures." She felt as though she couldn't tell if this was a picture book or a more grown-up book because of the shifting back and forth between formats. I noticed that the prose itself fluctuates between younger-child style and adult style, which also makes parts of the story harder to enjoy. My daughter also didn't like the part where Baylard was confused about grocery store doors because she could not glean that's what the author meant. She thought the pretty lady and Baylard actually entered the market through a window, even though she's quite familiar with the sliding glass doors the author intended to describe. That confusion detracted from the scene a great deal for her and she insisted that I mention this in the review. She also felt that some descriptions went on too long and "got boring". These are the sorts of thing a good editor can help an author clarify and improve. Overall, I think this story has potential. The story itself is imaginative and does a good job covering the tumultuous realities of adoption. Addressing the confusion and mixed emotions of what to call his new mother was nicely done, as were other aspects of the emotional difficulties adoptive children face. With some solid editing both for grammar and consistency it could be a great resource for adoptive families. My daughter and I agreed that it's a 4-star story, but the many errors that make it so hard to read - especially for the target audience - knock it down. If this was for adults I'd take it down to 3, but a children's book must be held to a higher standard of readability so I'm taking it down to 2. If it gets some professional editing and formatting, I'd be happy to change that back to the 4 stars the story deserves.